You are here: Home / Africa / Ethiopia / If They Build It, They Will Come. 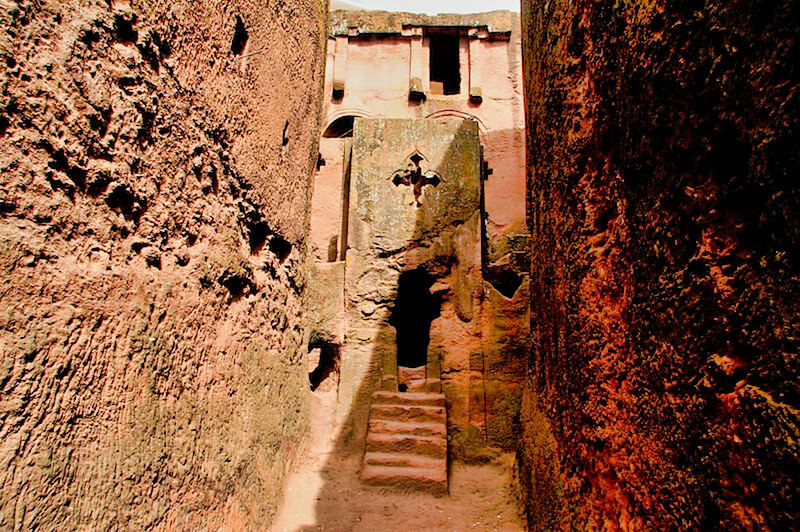 The Amazing Churches of Lalibela. 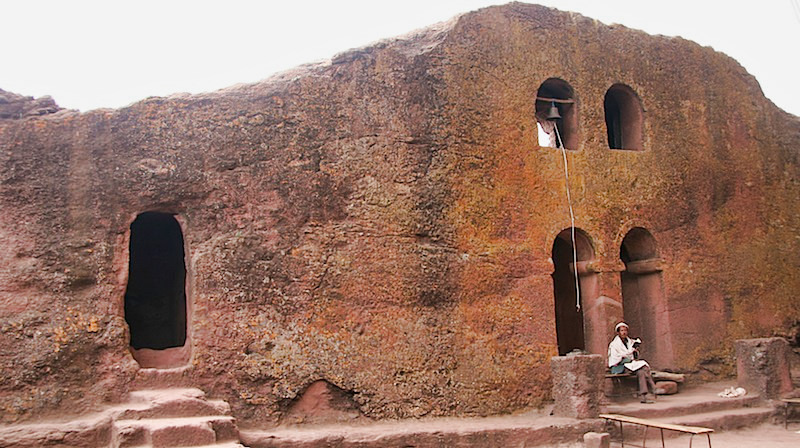 Situated in the highlands of northwestern Ethiopia at nearly 9,000 feet above sea level in the Lasta Mountains is perhaps the most spectacular collection of buildings and architecture in all of Africa. To be sure when one thinks of the great shrines of Christianity and and its history, Jerusalem, Greece, Italy, the United Kingdom and others come to mind. But Ethiopia? Usually not top of mind for those planning a Christian pilgrimage. But here high in the mountains are a collection of 1,000 year old churches hewn out of red volcanic rock that will awe, inspire and leave you speechless. 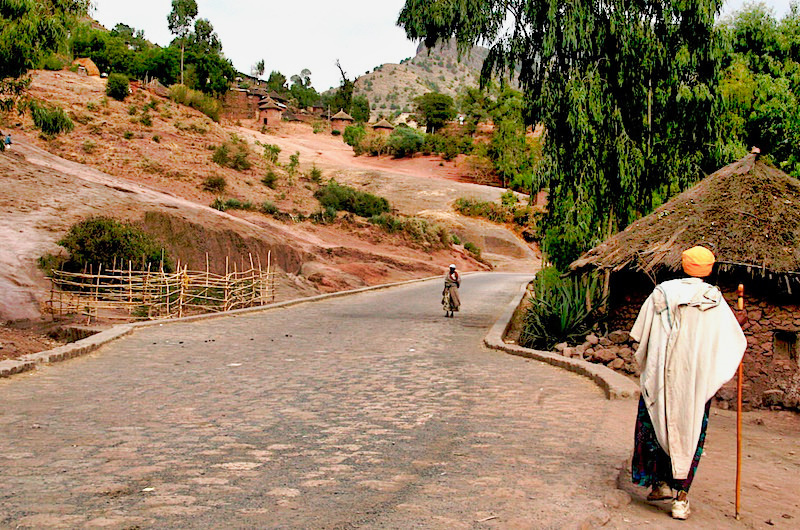 Wandering the streets of Lalibela. It seems nearly everyone finds time to pray or look to the gods. 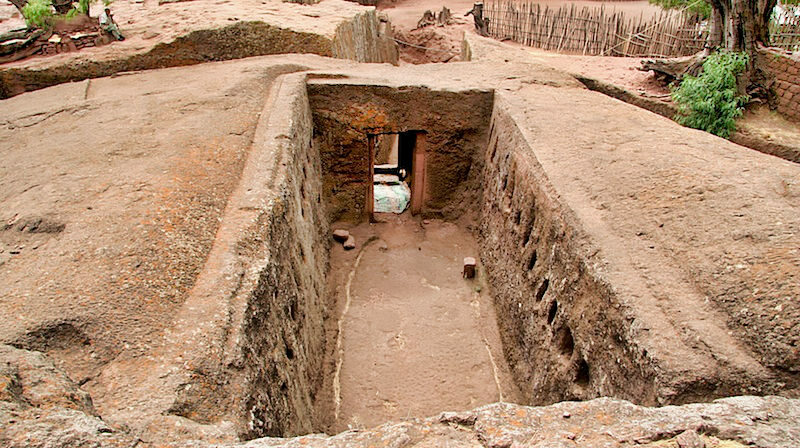 Depending on which historian you believe or the story that offers the most drama, the true history of Lalibela, considered to be Africa’s Petra, is questionable. 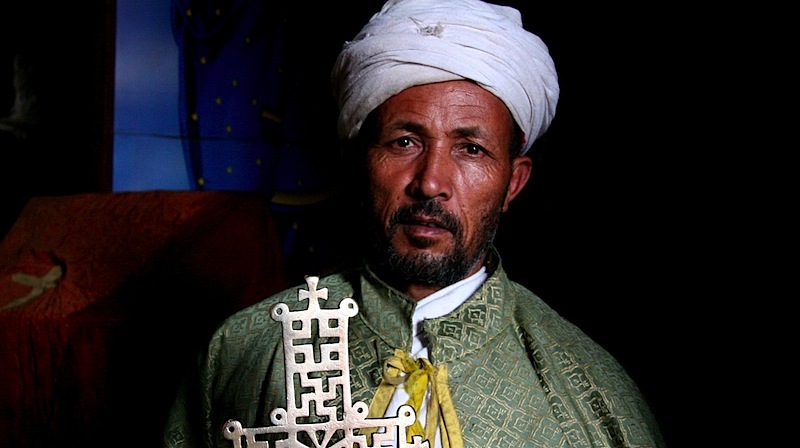 We’ve already established that Christianity appeared in Ethiopia at the time of the Apostles. 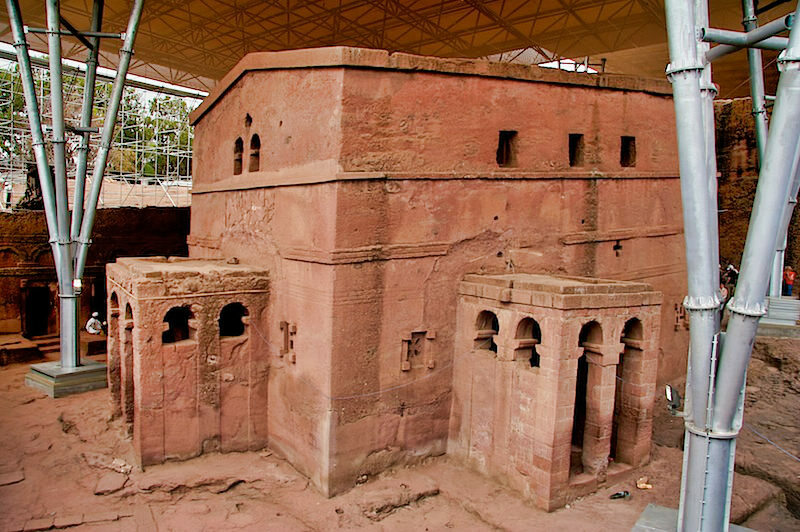 But King Lalibela (1181-1221) a member of the Zagwe dynasty, purportedly exiled or fled to Jerusalem for fear of his jealous half-brother who tried to poison him. 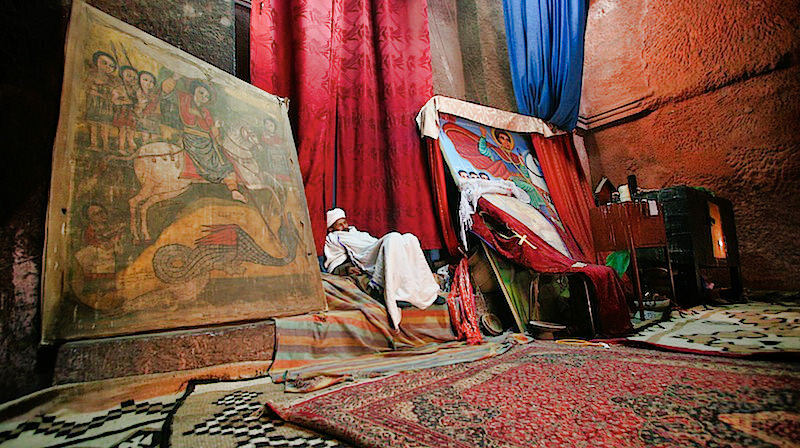 Amazed at what he saw in Jerusalem and when that city was captured by Muslim forces in 1187 preventing Ethiopian Pilgrims from visiting, now King, Lalibela declared the town (originally named Roha) to be a new Jerusalem. And somehow 11 rock-hewn churches of enormous proportions were carved from the top down, some lie nearly hidden in deep trenches, while others stand in open quarried caves. A dizzying labyrinth of tunnels and dark narrow passageways with creepy crypts, genuine grottos, and glorious galleries connect all of them. But how were they built? UNESCO built a large canopy to protect this 1,000 year monolithic church. 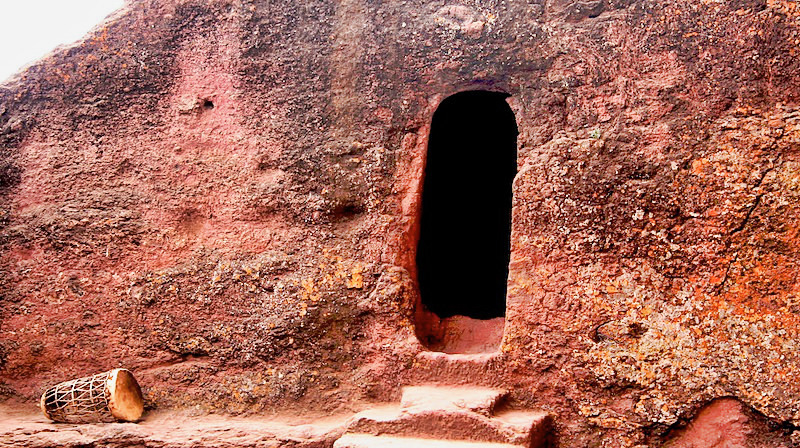 Another legend suggests Lalibela was built by angels armed with masonry tools. 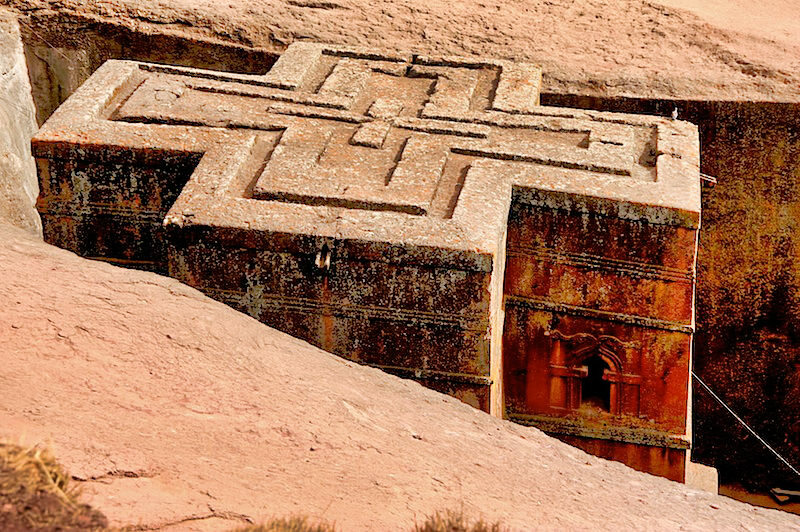 To be sure, archaeologists say it would have required the work of 40,000 men to carve the labyrinths of grottoes, courtyards, caverns, and walls out of the hard red volcanic rock. To understand the scale and work required to build these churches can only be realized in person. Safe to say, that here where there was once rock are now eleven churches. These weren’t built. No rock, plaster or other materials were added. Only rock that was carved and hauled away revealing this impressive array of holy edifices. Everything was carved from top to bottom using primitive tools. Some say while the workers slept angels worked. The scope of this place is mind-blowing To stand atop and look down. To sit below and look up. To wander inside and realized this was one rock. it’t the top of a mountain. They just started digging. No possible mistakes. And the shape is perfect. A cross. Inside imaginging all of this is tiresome as my friend the priest takes a load of his mind while flanked on either side by mine (and yours) favorite saint: George on his white horse. There are 11 churches in this complex and two others in nearby villages. 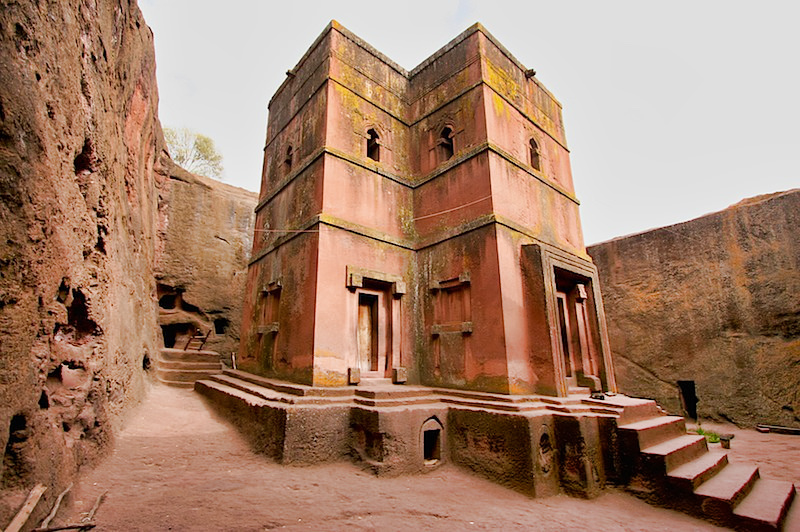 But you’ll find rock hewn churches and monasteries in many places in Ethiopia. Right inside the church they carved reliefs – on the walls, in the ceilings and sometimes on the ground. A maze of alleys, tunnels and walkways takes you through all 11 churches. Priests were happy to share their wares and their ancient artifacts. Many times you might find photos of these priests wearing sunglasses. They don’t do this to be cool. It’s because so many people use flash and it’s hard on the eyes. I did my best to hand hold the camera and capture the true essence of these holy men. It’s mandatory to take off footwear before wandering inside any of the churches. It’s also mandatory to hire an assistant to tend to your shoes. Mine was Endayene, who was markedly better than my dishonest guide. It takes a full day to explore the churches and the maze of alleyways and tunnels that connect them. Beyond the admission to the complex, I hired a guide to walk me through their history and the mind-boggling maze. 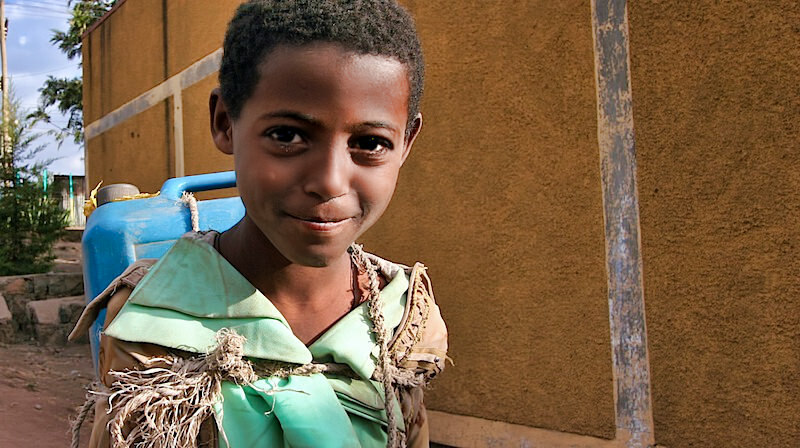 To be sure, the town surrounding Lalibela is a dusty village that through its daily pace of life seems hardly aware of the importance of these churches. But since they’ve been there for more than 1,000 years, I guess they’re just used to them. And so to offer the locals employment, it is mandatory that visitors hire an assistant, someone who will help you with your shoes as it’s also mandatory to take off your shoes before going inside these beautiful churches. So the assistant watches you shoes, will take them off, put them on and tie them, if you’d like. 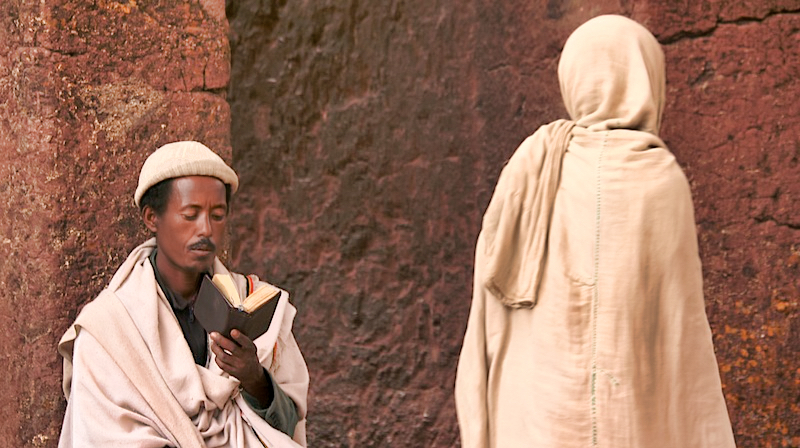 While Lalibela remains one of the highlight of the Ethiopian segment of my journey, my only regret is the guide I had chosen. I should’ve gone with my instincts. He was a weasel, stuck to me like glue and showered me with the accolades and certificates in tourism and English he’d earned. 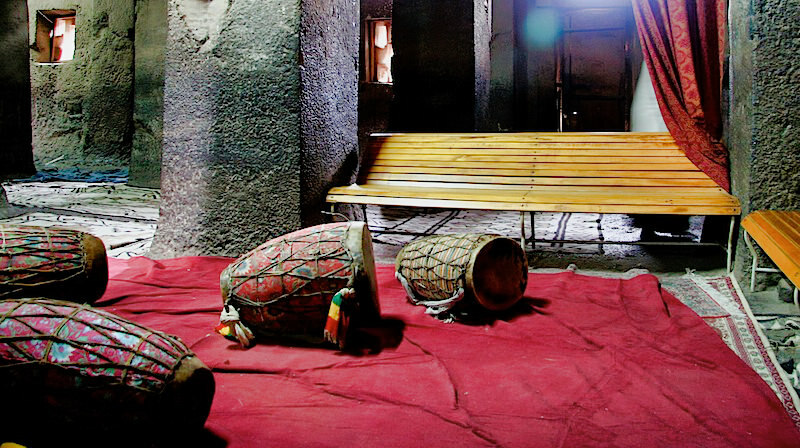 The drums are only used in holy ceremonies. I asked a priest to demonstrate. He told me to come back and he would during a ceremony. I’d like to return to Lalibela. It’s magical. 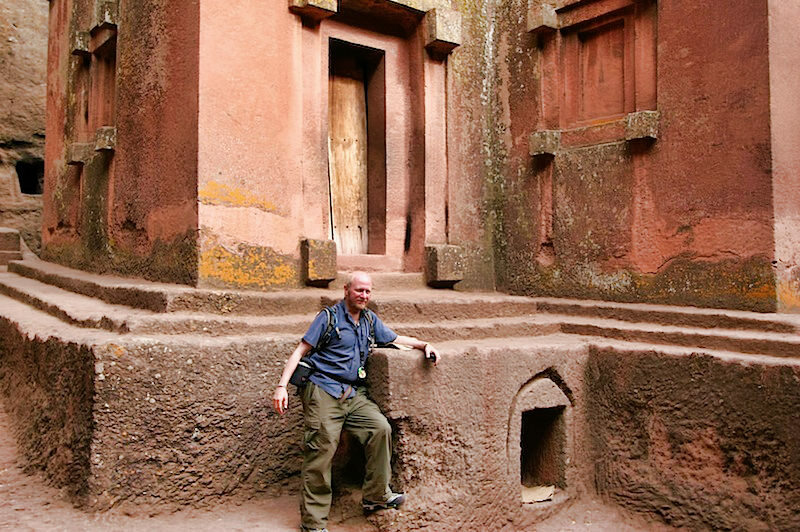 Don’t hire this guide when you visit Lalibela. He overcharged and tried to steal my camera. My guide? 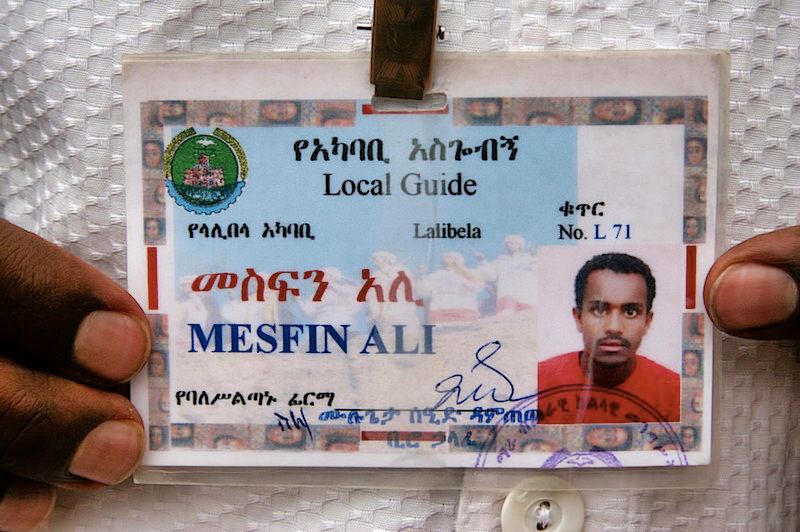 Let me explain why Mesfin Ali is perhaps the most awful and dishonest tour guide in all of Lalibela. He knew his history but when pressed for information on some of the Ethiopian Saints he made up answers, I verified this with a true historian later. Second, while I paid for a full day and started a bit late, he seemed to rush me through the churches. Always looking at his watch, I made him take me back for second views. He resented me for this. Third, he charged me too much. Had I chosen a guide referred from my hotel, I would have had better service and saved nearly 50%. He had an ego. This doesn’t bother me so much, but he liked to get in my photos. Worse, after I took a photo of my shoe “assistant” and his name badge, he kept asking me why. When I realized that I forgot to download photos from my DSLR and was running out of space on that camera, he was quick to point out that I should erase the photos of my assistant. Later when I allowed him to peruse the photos on the camera, he once again pointed out that I hadn’t erased the photo of the assistant. Now the clincher. At the last church we visited, Bet Medhane Alem, the largest monolithic church in the world, he asked if he could shoot some photos. I was preoccupied shooting with my DSLR, so I figured why not let him use my point and shoot. 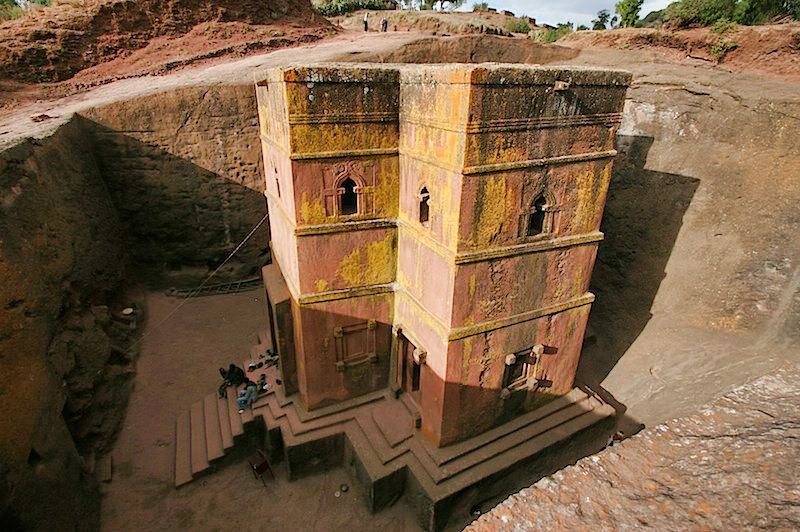 We went about exploring this massive edifice which stands 63 feet high, 45 feet wide and 24 feet deep, it resembles a Greek Temple and cut in the shape of a cross, it also reflects Ethiopia’s Jewish roots as the Star of David is carved high in the ceiling. I handed him the camera and he shot pictures as I took a moment and walked around. Then we entered the church. More pictures and more discussion of history and I chatted with the priest, which was a challenge as he didn’t speak any English and I caught him sleeping with a cross in his hand. I wanted to sit under a tree and just gaze upon the church and figured I’d just walk back to my hotel alone. I asked my guide if there was any place I could buy water nearby. He suggested it was rather far but he’d be happy to go get me some. Well really, he just handed the Birr I gave him to my assistant and asked him to fetch the water. He then said he needed to get home and left. When my assistant, Endayene returned with a tall bottle of cold water I was in heaven. Church wandering in this heat dehydrates you fast. Later that evening, after a wonderful dinner and intense conversation with Mesfin, the owner of Seven Olives Hotel (recommended) and his friend Daniel whose brother lives near my home in Orange County, I was packing in preparation of an early morning departure I realized I couldn’t find my Canon PowerShot camera. I tore the place up and down. Nothing. I did it again. Nothing. I was sure I had it that day, but no. Nothing. I was staying in a different hotel, but at nearly midnight I woke up the owner of my hotel and suggested that my guide never returned my camera. The next morning over breakfast the owner spent some time on the phone. Then nearly an hour later Mesfin, the guide, shows up with my camera. I played the incident down as I didn’t want to create waves in this small town. But he obviously tried to walk away with my camera hoping I wouldn’t notice. And it almost worked. He knew I was leaving early in the morning and he knew he had the camera as after leaving me waiting for my water at the churches he shot a handful of photos walking home. What’s even more disturbing is I saw him at the excellent restaurant at Seven Olives Hotel that evening hours after our time in the churches. He never said anything about the camera. This incident is highly unusual and would rarely happen most anywhere in Africa. I’ve left things in restaurants or on the counters of tourist places and others and always had them returned. This guy is bad news. 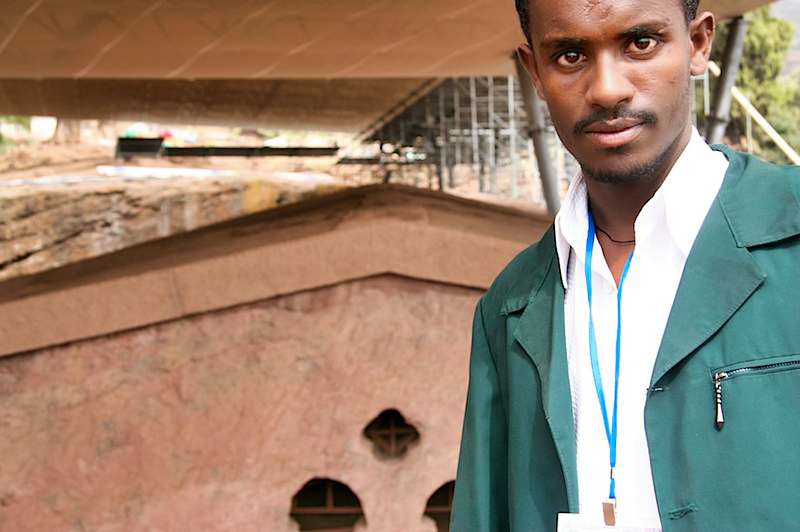 I hope my assistant, Endayene Derebe, whom I happily tipped, completes his studies and becomes a Lalibela guide. I can’t emphasize enough how good the food and view is at Seven Olives Hotel. The owner took a genuine interest in me and explained he’s developing an ego-friendly natural hotel in the style of the traditional homes in the area. Set to open next fall, it’s worth checking out Seven Olives and its new project, which at the time hadn’t been officially named. Ask for Mesfin, the owner and tell him WorldRider sent you! We spoke of politics, Ethiopian history, Ethiopian food and the growth of Lalibela which soon will be on the international tourist map and attracting more than just adventurers. It’s so remote that I think the integrity of the town will remain intact. But it truly is a must see for anyone going to Africa. I walked home alone to my hotel along a small dirt path where I met many locals. 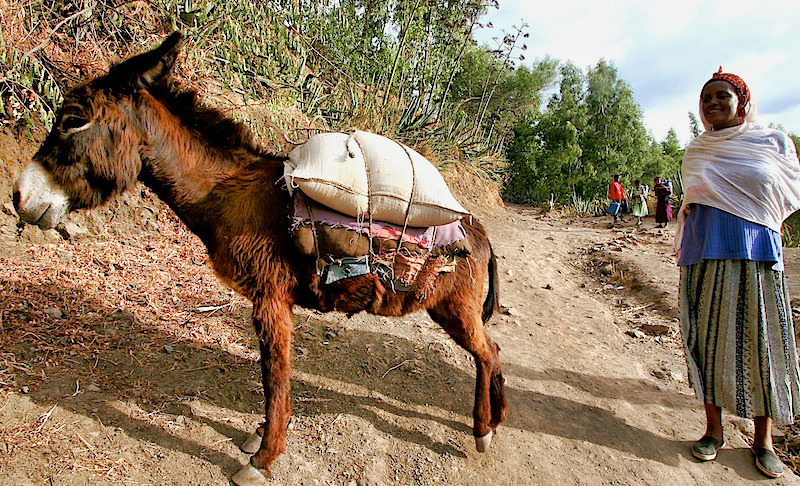 This woman didn’t have a name for her Donkey. She laughed when I asked. I said let’s call her Lolly – like Lalibela. She giggled and continued along her way. This young girl walked about 2 miles with that blue container full of water (15-20 liters?) on her back. Her brother and I walked with her together to the main road. I asked all along why he didn’t help her. Then finally at the main road he took the pack of water from her and walked home. Sadly, there home was about 100 meters away. Nice brother! I arrived the next morning back in Gonder and began preparing the bike for the journey to Sudan. That’s when it hit me. I as anxious to spend more time walking around Gonder, but I was hit with some sort of fever. I lied down and my body shook uncontrollably. I was bummed that the Irish pharmacists who I befriended earlier in the week had gone, secretly hoping they had the magic potion that could cure what’s ailing me. But I was seriously scared. I tried to remember when I stopped taking my malaria tablets, but the symptoms I was experiencing read like a text book description of malaria. Interestingly enough, a young medical intern took residence in the room next to me. My fever was high but it was too difficult to tell without a blood test. I thought maybe the cold and shivering boat ride on Lake Tana may be finally hitting me. All I knew was I was weak, shaking and sick to my stomach and nauseated. I tried to sleep. Everyone at hotel I enquired with about my symptoms and malaria warned me against leaving on the bike across the desert the following morning. “Make sure you’re strong enough,” one nurse in training asserted. “We don’t want you to leave now,” my friends Gareth and Helen who just returned from Lake Tana and were still waiting for a shipment of a new brake caliper from the USA. I tried eating but could barely swallow a bite. I shut myself in the room and forced myself to sleep. I gotta make it to the Sudan border tomorrow so I’ll have exactly a week in Sudan before the ferry to Egypt departs. If I’m not on that ferry, I’m a the whim of the Sudanese justice system — if there is such a thing. Wandering Castles & Palaces Thinking Donkeys. Again. Making Friends. Sick In Bed.